How to trisect an angle ! How to trisect an angle (with ruler and compasses only) ! From point A draw a vertical line and another line angling off to the right by angle β which you wish to trisect. At an arbitrary point B on the vertical line construct a right angle and draw the extended horizontal line BC. 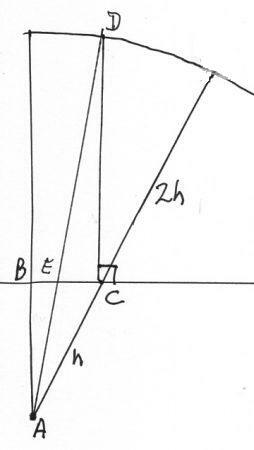 The distance h is the length of the hypoteneuse of the triangle BAC, namely AC. Draw a large number of rays from A, marking their upper endpoints D such that the distance above the extended horizontal line BC is in each case 2h. 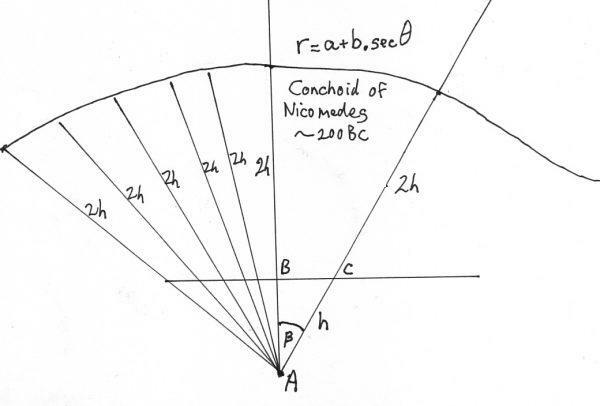 The loci of the upper endpoints describe a curve known as the Conchoid of Nicomedes ( circa 200 BC). Forgive the inaccuracy of my hand-sketched (=not constructed) conchoid, please. Now we have the conchoid, we can proceed with the actual trisection. I refer you to my sketch on the left. Draw a line DA connecting D on the conchoid with the origin at A. It intersects the horizontal BC at point E. DE=2h, remember. Although my construct shown above does in fact trisect the angle β (I won't bore you with the proof, suffice that it exists), it does remain impossible to do the trisection while complying with Euclid's compass and straightedge only requirement. Siglinde (Cheb) complains "Obviously it only works for acute angles, not for obtuse or even right angles, so it is at best a partial solution :-(" Mea Culpa. Ivan (Moscow) says "You also would have to interpolate the conchoid between constructed points, which is cheating on Euclid too!". Yup, you caught that one too. Barbara (15, Florida) noted gleefully " Even my math teacher didn't know that! I practised at home with 60° for an hour then showed her today and got a result measured with a protractor of 20° ! Great Show-and-Tell! Thankyou, Stu :-)"